Pet Friendly (See details below.) 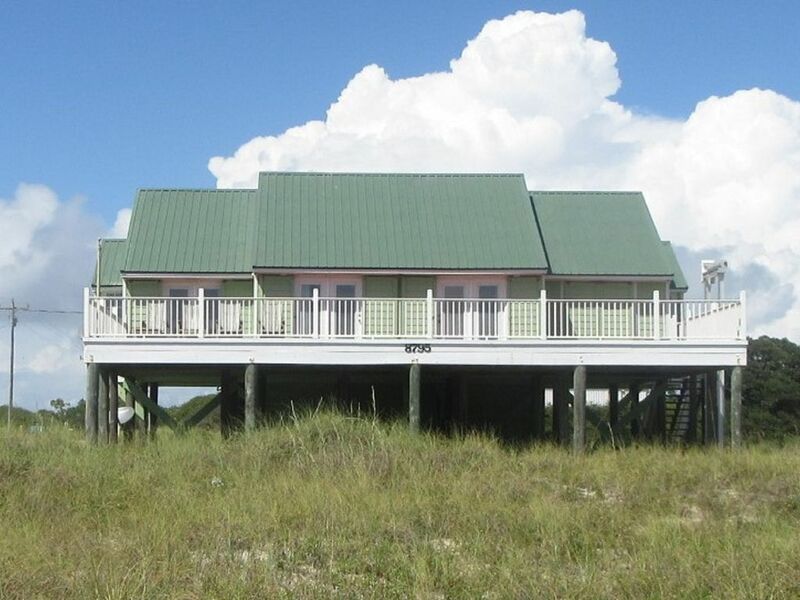 This 4 bedroom beach house is truly "Good for the Soul"! It's more than a name, it describes the feeling you will get when when you step onto the huge sun deck and see the magnificent view and actually breathe the air while hearing the rush of the waves. You won't be able to resist the urge to run through the sugar white sand to the beach and splash in the Gulf of Mexico! Don't even worry about packing a lot of gear to the beach because everything is just a short walk back! After enjoying the beach, you will love the outdoor shower and swings under the house where its shaded and a cool wind blows. The open floor plan allows everyone to be together and enjoy the Gulf Views while lounging or watching TV in the living area, dining at the family table, or while preparing meals or just making a snack in the kitchen. Two bedrooms and the living/dining area have double glass panel doors that lead to the sun deck and allows plenty of natural light inside and a fantastic view. The other 2 bedrooms have windows with a "Gulf View"! The doors and windows are conveniently equipped with shades so everyone can sleep late, even the guest on the sofa sleeper! The 4 bedrooms are located on each corner of the house and a full bath is on both ends. The home is equipped with a full size washer and dryer, full size kitchen appliances, including a dishwasher,. The small appliances include a coffee maker, toaster, blender, hand mixer and a can opener. The cabinets are fully stocked with dishes, utensils, and cookware. A "one day" supply of hand washing & automatic dish washing detergent, cloths detergent, one garbage bag & one roll of paper towels are supplied. Please bring food, paper good, detergents, and more trash bags. The beds are made with fresh white linen and a sofa sleeper linen set is provided. Both bathrooms are supplied with one roll of toilet tissue, a personal bar of soap and shampoo/conditioner. Please bring beach towels and toiletries. PET FRIENDLY: Owner allows up to two dogs with a 60 pound limit each. Must be leashed when outside of house or at the beach. Pet owner must clean up behind them. No cats are are allowed. Other types of pets may be allow upon approval. This property is managed by Pam Martin, Realtor, licensed in Alabama, Keller Williams Alabama Gulf Coast of Orange Beach. This property is just steps away from an uncrowded beach. Pet Friendly 4 bedroom beach house is truly "Good for the Soul"! There are three bathrooms. Two are upstairs and have a tub/shower combo. They are located on each side of the home and each bathroom services the 2 bedrooms on each side. There is a downstairs bathroom with a shower that services the downstairs bunk room and for outside entertaining. The home is just steps away from a sugar white sand beach and the Beach Club Resort. Historic Fort Morgan is a just a 10 minute drive to the West where you will experience breathtaking views! The owner is a member of the Beach Club which is located right next door to the beach access area. You may walk to their boardwalk to the clubhouse or drive. It is less than a 1/4 from the entrance of Cabana Beach, to the West on Fort Morgan Road, Hwy 180. You may dine at the seasonal restaurant and patron their shops and salons without a daily fee, but if you would like to access the private amenities, a daily fee applies. It is approximately $45 per day for your entire party, payable at The Clubhouse Desk by you, in person. Our family gathers every 2 years in Gulf Shores for a reunion, and we rented "Good for the Soul" this year. The house was very well maintained, the set up was perfect with the bedrooms and bathrooms on each side and the open kitchen/living/dining area was perfect for gathering with family. Pam and her team did a great job responding to any questions we had in a timely manner, we will definitely look to rent this property again. It was beautiful. Well furnished and great view of gulf from the awesome deck. It was great for our family and we plan to stay again. Our family loved this beach house. Plenty of room and it was so relaxing. We would definitely stay again. It was so nice to lay in the lounge chairs on the huge deck and enjoy the view of the beach and listen to the waves. We even saw dolphins on the last morning. Loved the owners decor and how everything we needed was provided!! Hated to leave. Our 2 year old granddaughter didn't want to leave the "beachhouse". It Was Good for the Soul! We had a big bunch & had a great time! House is laid out well, easy walk to a great, less crowded beach. Really nice being located right next to the resort where you can rent chairs/umbrellas, play volleyball and stuff. Terrific big deck to relax on. Would rent again! Our family went to this home last week and had a wonderful time! The decor was very sunny and bright. The front deck had plenty of room for all of us, including our two Dogs, with great views of the beach. There is also comfortable seating downstairs on patio with two great swings. You are only steps from the beach! Very quiet beach community feel. If you are bringing pets I would suggest a pet or baby gate. You will be about 12 miles out of town but there are couple of good restaurants close by, and convenience stores. We bought groceries and cooked in spacious kitchen most days! Enjoy! This is the perfect little beach cottage. Easy walk to the beach and beautiful views from the gigantic front porch!! This beach house is on the second tier from the beach and right next door to The Beach Club where parasailing, rental loungers, access to the salon, spa and several restaurants are available to the public and just steps away.